Well, I've finally done it. 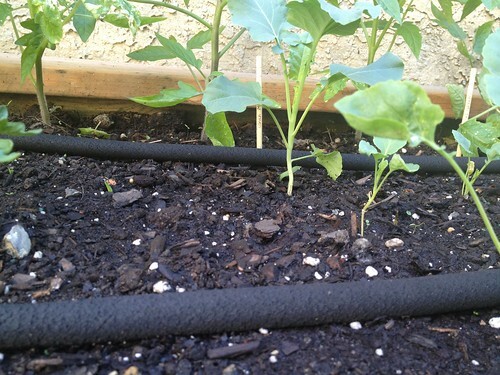 I went and spent $30 on this "snip and drip" irrigation system: [caption id="" align="alignnone" width="500"] black hose is the soaker hose[/caption] Wow!! I've never done this before because I've never uh had a working hose outside. That's right, for 2+ years I watered all my plants with two watering cans filled up at my kitchen sink multiple times a day (except for that short period when I thought the outside water line in our old house was working but then it turned out it was cracked and flooding our neighbors' basements. Sorry!) Just having a hose was already pretty sweet, but then my annual freak out about not being able to water my plants while I'm at work - "If they're drying out during the day in early May what's going to happen in July and August??" 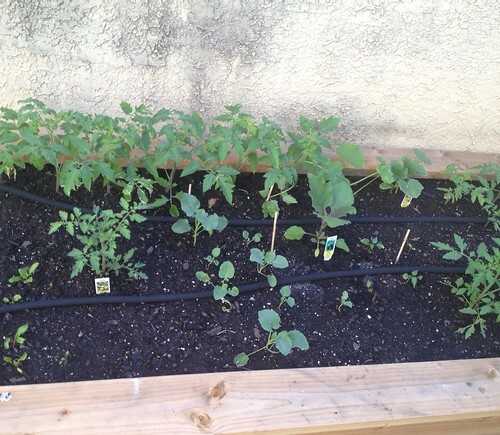 - I realized that I could just order one of these do-it-yourself irrigation kits. So I did! [caption id="" align="alignnone" width="500"] raspberries are going to be so happy[/caption] I'm not going to say too much about it because if you Google "snip and drip irrigation" you'll get tons of reviews of various products that are essentially just a length of black soaker hose and green regular hose that you connect via little black clips. There's another black clip for the end and you attach it to your hose with yet another black clip, and that was the only tricky part until I realized I was trying to connect them backwards. But there are lots of online videos to help you with that one. And then you turn on the water and watch the soaker hose soak the dirt around it - avoiding all the foliage!! - and breathe a big sigh of relief. Finally! [caption id="" align="alignnone" width="500"] raised bed with irrigation[/caption] So here's the obvious problem: it's ugly. I figure in about a month the plants will be so big that they'll completely cover the soaker hose and probably even the regular hose connector sections. But what to do until then?? Well, I've been thinking about drilling holes into the raised bed so that you don't see the hose sticking out on either end. I also need to get some of those metal clips that hold hoses down in the dirt because I think that will make them less visible too. Ultimately, though, this is still kind of a trial run: I'm not going to drill any holes until I'm totally satisfied that the plants are getting enough water. The good thing about this system is that it comes with 50' of soaker hose and 25' of regular hose and you just cut them to whatever length you need. You can also get a timer so that everything gets watered automatically! But I'm not ready for that level of sophistication quite yet. I'm mostly excited about the fact that I can water my plants without getting water on the leaves. When you water at night, getting water on the leaves is no problem because it has all night to evaporate. But when you water in the morning a lot of times droplets of water are still on the plant leaves when the sun hits them and that leads to scorching, like in this picture: [caption id="" align="alignnone" width="500"] see the white on some of the leaves in the background - that's from the sun burning off water that was on the leaves[/caption] The leaf scorching isn't really a big deal - as long as it's only a few leaves on each plant the plant's going to be fine and it doesn't affect the fruit at all. But it is kind of ugly and watering this raised bed with the hose it was impossible not to get water on everything: dirt, leaves, the wall behind it, me, my cat... you get the picture. 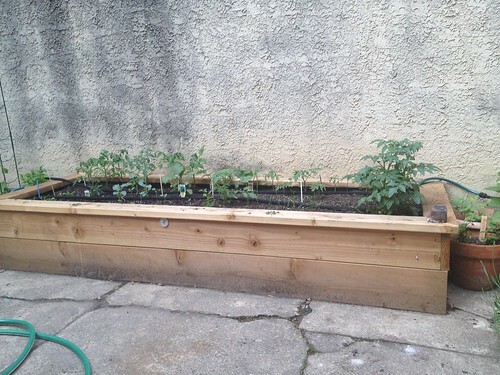 But really, the best thing about this is that my plants will get a steady stream of water which is best for vegetables. 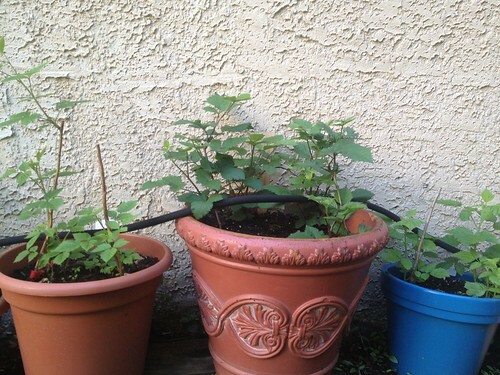 It's so hard to keep pots watered in the middle of the summer - I've been known to run home on my lunch break to water - and uneven watering leads to cracking and other vegetable problems. So now with my raised bed and irrigation system I'm all ready for summer! Let's go, veggies.